Summer’s End — Let Go — Let it Flow! “I hate September,” Thorn repeated. 1. Think about the worst problem in your life right now. What can you let go of that may help your situation? What personal behavior patterns can you change to help your situation? 2. Do a release ritual. Whether you choose petition magick, candle magick, or take a walk to your favorite magickal place — be active in positive change rather than passive, stewing in worry. If one ritual doesn’t do it for you, do at least three total, with one or two week intervals. 3. Bring the autumn season, in all its glory, into your life. Acknowledge the beauty of this moment in time. Plan an autumn party with friends to release fear and worry and welcome the amazing bounty of the season. Here, at the BFC hearthstone, we have several of these parties planned including the annual HedgeWitch Herb Harvest Party. The herb harvest includes the cutting down of the garden, a small bonfire and blessing, and a covered dish feast. 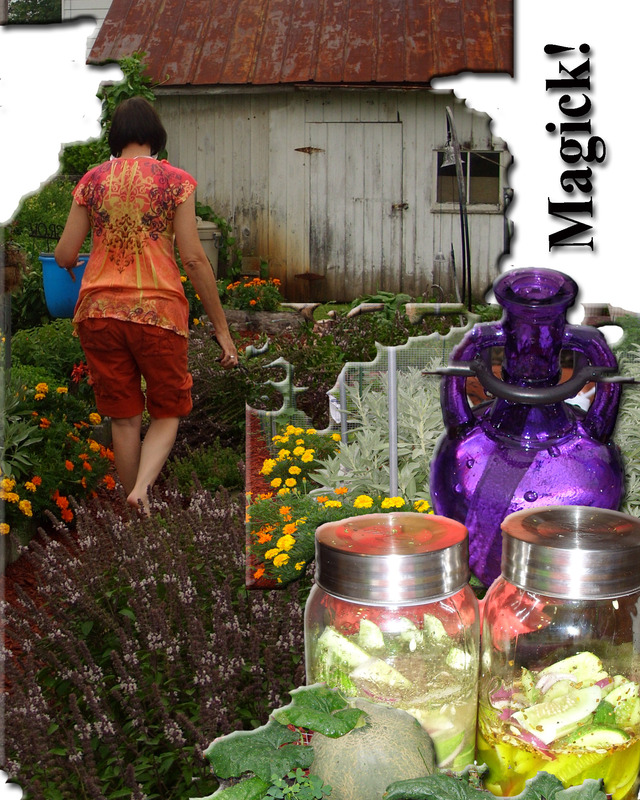 The herbs I grow in the summer are then distributed to all who participate to take home, dry, and use as they please. 4. Start cleaning house. Even if you worked with me through the HedgeWitch Release program last winter, you’ll have stuff to get rid of that you’ve collected this spring and summer. Try one drawer at a time. One cabinet. One corner of a room. Slow and steady brings bright and beautiful energies. You don’t have to be a cleaning tornado to benefit. 5. Whatever you do — Do NOT give up. Keep going. Just remember the old Pow-Wow charm — Lolly, Lolly Chicken Dirt, by tomorrow it won’t hurt! Sounds like the dumbest thing in the world to say, but, it works! Remember, nothing is permanent, and everything has the possibility of positive change! 6. Each morning, list off verbally all the things you love about the season, no matter how inane it sounds. The more you think about the things you like, the lighter in mind and spirit you will become! Here’s my list for today: Halloween decorations, pumpkins, the sweet smell of herb harvest, making pickles, the musky scent of autumn days, cozy thick sweaters. Now, you try! These are just a few ideas of working with the closure energies of autumn. Have ideas I didn’t list? Be sure to add them to the bottom of this blog, or visit http://www.silverravenwolf.com and add your ideas to our message boards. Together — we learn! United — we shine! “Did you find anything cool?” asked my daughter as we meandered in and out of the packed aisles of a little country store that featured all things decoratively homey. “Okay,” she said brightly, switching her already overflowing basket from one hand to the other. She headed off to another area of the store while I stood there staring at a plethora of grungy candles, fall wreathes, and sweet-smelling, handmade pillows with pumpkins, ghosts, and scarecrows waiting patiently for a good home. Argh. Nothing appealed to me. This day, my daughter and I were indulging on a shopping excursion to take my mind away from my problems with my father, the unwilling servant of the Goddess Dementia. I felt that I should buy at least one thing as a testament of my willingness to continue to be a normal person out in the world. My daughter had made a special effort to pick me up and bring me to this store. The last thing I wanted to do was disappoint her. She’d made the effort to get me out here, away from the madness of repetitive stories, memories that had no basis in fact, and the hostility of a two-year-old mind in a 178 pound body of an adult. The least I could do was act like I was having a good time and find something unique to call my own. I was, indeed, having a great time — I was just having a problem finding something unusual (the number one criteria of anything I purchase which is why I have so many ugly-cool things in my living area — sometimes unique is far from beautiful). I wandered upstairs and down in the house-converted-store with no luck. Sure, I liked the 900 pound clock on the wall — who wouldn’t — but; the Virgo brain squashed that one quick. I shuffled out into the sun room filled with the remnants of spring and summer gardening things. “Go ahead, I’ll be right behind you,” I answered, and turned to follow, promptly tripping over a painted wooden striped cat. “What the?” I muttered and picked him up to set him right. “That’s certainly unique,” I thought. “And he’s not even ugly. Too bad its a bird house.” I brushed him off, eyed him for a moment, checked the price, put him down quickly and walked away. Maybe another time. I made one more trip around the store on my daughter’s advice; but, nothing jumped out at me. I kept thinking about that cat. What could I use it for? He had a hole in his stomach because he was a bird house. I could save him until spring…nah. It was too nice to put outside anyway. Eventually, I found myself back in the sun room. I stared at the cat. Unblinking, he stared back. I hunched my shoulders and frowned, eyeing him closely. He grinned back. I circled him like a predatory something-or-other. He stood very still and let me inch closer. I cocked my eyebrow and stuck out my tongue at his retreating back. Really, now. Is that what you think? Aloud, I said nothing. In the world of magick you pay close heed to the observers around you. Major Witchy Rule of Thumb: If someone is in doubt, keep your mouth shut. So, I did. Weeks went by and I didn’t make any effort to use the cat. Just dusted him. Family members remarked on his presence; but, I didn’t say a whole lot about him. During our healing circles, with Wiccans, Witches, Pow-Wow’s and Pagans present, he observed from his vantage point, taking it all in. From flying holy water to a bonfire cauldrons, spilled wax on the tablecloth, laughter, chanting, drumming, bells, gongs, and off-key singing, he never moved from his perch — he just took it all in. Did I mention we’re not particularly quiet in healing circle? Anyway! Every morning I would sit at the dining room table trying to wake up, clutching a cup of tea, attempting to enjoy a few precious moments of silence, staring at the cat through fog filled eyes. The cat always smiled back. Which was a good thing. Sometimes, during the day, I would sit just for a moment to catch my breath and the cat kindly didn’t utter a sound. During a particularly stressful week, I plopped my behind in the chair, my gaze automatically wandering to the cat. I’d left several messages (via cell phone of course — that thing that is supposed to connect in 60 seconds?) to someone on important family business and they hadn’t returned my calls. I was feeling frustrated with a heap of worry on top. “Do it,” I said, and specifically told him aloud who I wanted to contact, forming a picture of that person in my mind, and that I wanted a return call immediately. Within 30 seconds, I kid you not, my cell phone rang, and it was precisely the party I’d asked for, profusely apologizing for the delay in returning my calls. After our conversation was over I disconnected the call, and smiled at the cat. “Good job!” I said. Yeah, and without a contract and plenty of free magickal kitty minutes. I’ll definitely stick with the cat with world wide access! Note: Other than this story being food-for-enchanting-thought — it really does have a point. We all want our spells to work better and faster; yet, we understand that just as with any formula, there are several variables that can make or break the goal. The rule: To Be Silent isn’t just for kicks — in quantum physics, the observer (whomever that might be) can and WILL affect your workings. If you know that there is any doubt around you on what you want to do — make a concerted effort to keep your work to yourself. Your silence can make or break your success. Keeping you work unique also can be very effective, as with the cat I used in the story. 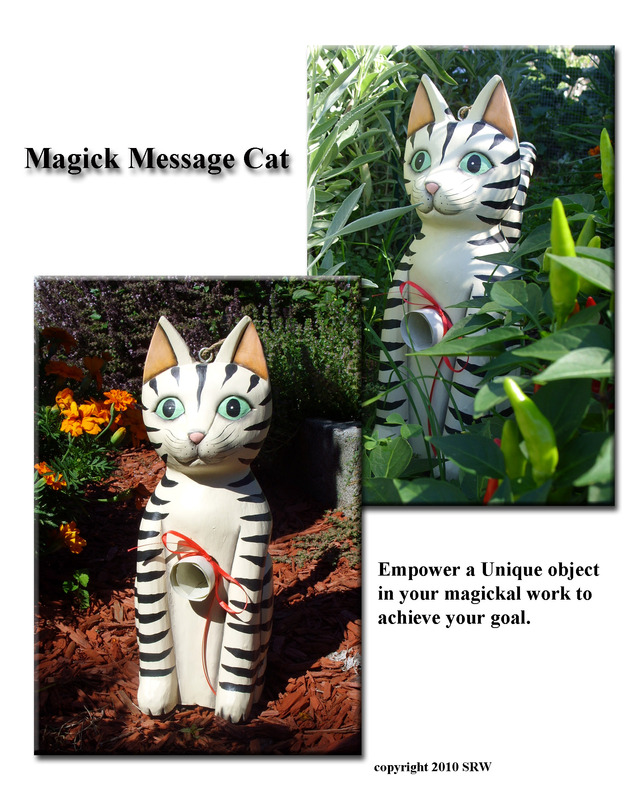 If you learn to use unique items (such as the cat) and follow your intuition on how it is to be used, you may find great improvement in your workings. What’s the harm in trying? Who is going to know except you? Go for it! Have a unique magickal tool story to tell? Post it to this blog or visit my website at http://www.silverravenwolf.com and tell us all about it on the message boards. We’d love to hear! In uniting we learn.